With Jio commercial launch now only days away, newer information has started getting leaked at a faster pace than the previous months. 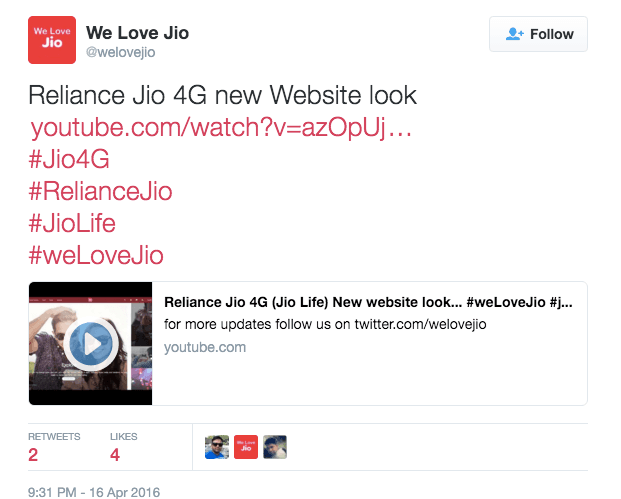 In the newest bit that has surfaced, one of our readers has shared across a YouTube link to the pre launch preview of the Jio official website. In the above video you can get the first glimpses of the graphic rich layout of the Jio website. The site showcases all the offerings of Jio ranging from devices like handsets, MiFi devices, home broadband router to the digital content offering like Jio play, on demand, mags, beats, etc. all of which are being offered with unlimited access for 90 days including 101GB of free storage on Jio drive. The fluidity of the animations in the site are also amazingly smooth. The top bar has shortcuts to Home, Digital stores, Shop, Apps, Support, Search, hotspot locator, shopping cart, Quick pay. The bottom quick navigation section displays support for multiple languages including a host of south indian languages. The site showcases the Jio Join app for voice solution for non VoLTE handsets and Jio money app as a digital wallet payment platform. The same benefit as bundled usage that came with employee sim cards seems to have been extended to sims bundled with new LYF handsets of Earth, Water, Wind and Flame series giving 75GB LTE data, 4500 mins of local and STD calls, 9000 SMS for 90 days and in all likelihood the data usage through Jio media apps will not eat away this 75GB data due to intranet benefit. Also the MiFi device is listed at Rs.1999. Special credits: Sunny and NTL for sharing the links to the videos above. How it can be possible that in one place hoarding is being displayed every where and nowhere is seen in Mumbai .